I had a bit of a hard time getting the candy melts as thin as I wanted, so the bunnies are a little more full- figured than I had envisioned, but they still look pretty cute. Even so, I think these bunny truffles are going to make some munchkins very happy! Mr. Munchkin Munchies ate one and thought it was sooooo good! 1. Place all of the cookies in a food processor and process into fine crumbs. Add 1 cup of chocolate frosting and mix in food processor until thoroughly blended. 2. Use a small cookie scoop and form into balls (you will have to smooth them out with your hands). Makes 2 dozen. Set the truffles on a baking sheet lined with wax paper. Set them in the refrigerator to chill/firm, at least 15 minutes. Prepare the bunny ingredients while the truffles chill. 3. With kitchen scissors cut the pink hearts in half vertically, directly down the middle, producing two "ears" and set aside. (With regular marshmallows cut them vertically in half, and then in half again to end up with four long ears.) Use the pink edible marker and add detail to the ears. set aside. 4. Snip small bits of marshmallows to fashion into cotton tails for the bunnies. 5. With the kitchen scissors (or a small, sharp knife) cut the jelly beans in half and set aside for the noses. 6. Get the mint truffles from the refrigerator. Melt the candy melts according to package directions in a small deep bowl. 7. Take two truffles and stack one on top of the other. Stick a toothpick down the middle of both truffles, but leave about an inch poking out of the top. 8. Holding the toothpick, dip the stacked truffles into the melted candy until completely coated. Let the excess drip off over the bowl. Set the "bunny" on wax paper and be sure to gently remove the toothpick before the candy completely dries (If it leaves a hole, just fill it with more melted candy). 9. Place the marshmallow bunny ears on the bunny's head (while candy mels are still wet) and hold them in place until they stay put (It took only about 10 seconds). 10. Usee half of a jelly bean and place it for the bunny's nose. Do the same thing for the tail. After the candy is completely dry, use the black edible marker for the details on the bunny's face: eyes, whiskers and mouth. 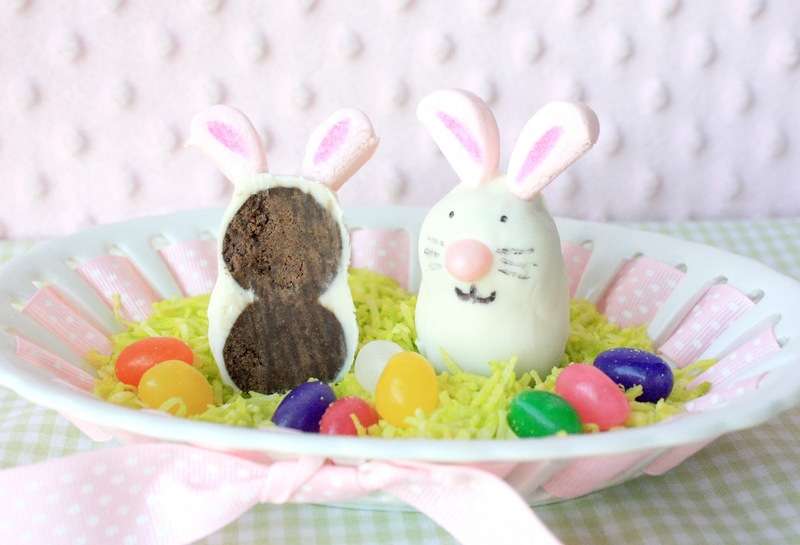 FYI: Coconut (tinted green) was used for the bunny truffle display. Makes 1 dozen bunny truffles. It must have been hard to eat these little guys...they are just so cute!!! I can't stop smiling at how cute they are! You know these bunnies are pure awesome, right?! So adorable... love their little tails! These are so so cute!!! I love their little noses! These are so cute, Sue! I love the view from behind - they look like to old bunnies having a chat! They are so cute! Hello, I'm a new follower; found you at the Inspiration Friday party. You are very cute, makes me smile and think of fuzzy bunnies. I guess that would make it even harder to eat them though! lol Hope you'll stop by and join my blog also. Have a great weekend. 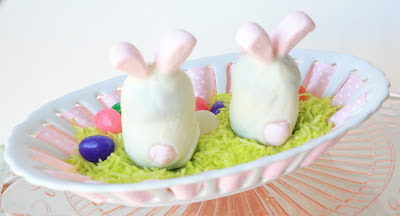 Very cute may have to try these for easter! I can see what you mean about the pen - was it becasue they were moist? Very cute! My niece and nephews would love these. Thanks for sharing. How cute are these!! I thought that these were adorable from the front then you showed the back view! The little tails are the perfect finishing touch. Love the ears and the little bunny tails! Too perfect! These are so cute and I love how you called them "full figured"! 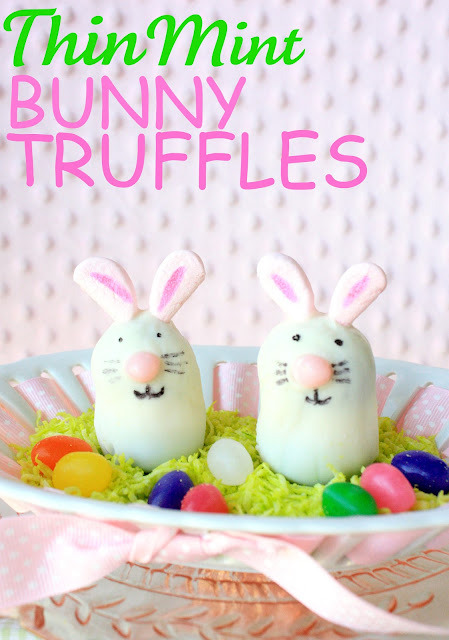 Double trouble bunny truffles. I LOVE them. So cute. 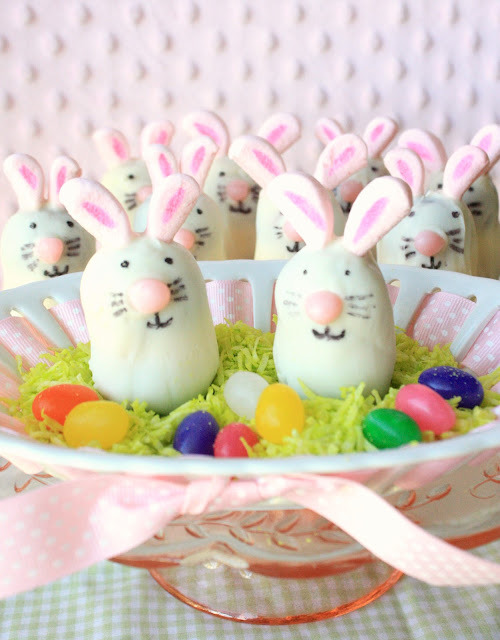 Those are the cutest (and yummiest) bunny truffles I have seen!!! I just love all the details that you added to the ears and then the tail is perfect!!!! SO SO SO SO SO CUTE! adorable! especially love the backs! I sure am glad we got to see their cute fluffy buns! They are too cute and thin mints would make them the best. I like their full figures! This is all the cuteness one can handle wrapped up in a yummy treat with some personality! Very very cute, Sue. No doubt those munchkins will be thrilled with their bunnies! Hehe, they look great, Sue. I love their little pink tails. Cute! I'am so inspired!!! Truly adorable. I cannot believe we're approaching Easter already! I still feel like we haven't properly covered Halloween lol It all webt by so fast! I love your bunnies, Sue - so adorable. I can't believe you created them with thin mints and marshmallows! SO talented! Oh Sue!! Seriously, every time I see your links I pass out from their cuteness! These are amazing! We will be sharing these at Inspiration Friday this week. WOW!!! Another incredible yummy project!! I posted this on FB last week. These make me so happy! Thanks for sharing at oopsey daisy! It's an remarkable paragraph in support of all the web viewers; they will obtain benefit from it I am sure. The brown-slatted background in the image above really isn't part of the technique I was trying to demonstrate here. revisit yet again since i have saved as a favorite it.